NASA is counting down to a New Year at the moon with two new robot probes arriving in lunar orbit this weekend. 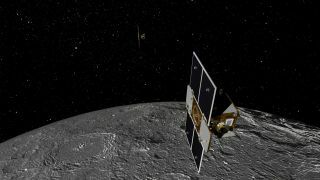 NASA's twin Grail spacecraft are closing in on the moon to map its gravitational field like no other mission has before. The first probe is slated to fire its rocket engine on Saturday (Dec. 31) at 4:21 p.m. EST (2121 GMT) to enter lunar orbit. The second spacecraft should follow with an engine burn of its own on Sunday (Jan. 1) at 5:05 p.m. EST (2205 GMT), NASA officials said. The $496 million spacecraft, which are known as Grail-A and Grail-B for now, are expected to perform their lunar orbit entry maneuvers autonomously, without help from their mission control centers on Earth. But a team of about 40 Grail mission scientists is spending the New Year's weekend hovering over computers — at NASA's Jet Propulsion Laboratory (JPL) in Pasadena, Calif., and the Colorado offices of aerospace firm Lockheed Martin, which built the spacecraft — just to be sure. "The anxiety level is heightened right now, and it is more so than with other missions, because we do have two spacecraft to go into lunar orbit," Grail project manager David Lehman of JPL told reporters earlier this week. "But we've been studying and working on this for three or four years — four years — and we're well-prepared for that." "This mission will rewrite the textbooks on the evolution of the moon," said Maria Zuber, GRAIL principal investigator from the Massachusetts Institute of Technology in Cambridge, in a statement. "Our two spacecraft are operating so well during their journey that we have performed a full test of our science instrument and confirmed the performance required to meet our science objectives." The Grail probes are mirror twins of each other, with each carrying a microwave ranging instrument, accelerometer and star camera to perform its mission. Once at the moon, the spacecraft will fly in formation, one after the other, in an orbit about 34 miles (55 kilometers) above the moon. The spacecraft will stay between 75 to 225 miles (121 to 362 km) apart during their 82-day science mission and measure the changes in their separation distance in extreme detail, which scientists will then use to build an ultra-precise map of the moon's gravity field. The Grail probes will observe the entire moon three times during the mission. But first, the spacecraft have to actually enter orbit around the moon. To do that, Grail-A and Grail-B will fire their engines about 25 hours apart to put themselves in lunar orbit. "As they close in on the moon, both orbiters move toward the moon from the south, flying nearly directly over the lunar south pole," NASA officials explained in a statement. The Grail-A probe's maneuver will last about 40 minutes and slow the spacecraft by about 427 mph (688 kph). Grail-B will fire its engine for about 39 minutes and slow itself by about 430 mph (692 kph). If all goes well, the two spacecraft should enter an elliptical orbit that carries them over the moon's poles once every 11 1/2 hours. Over time, the orbit will be refined by more maneuvers to lower the Grail probes to their final 34-mile altitude. This weekend's lunar orbital arrival comes at the end of a long journey for the Grail spacecraft, which will have traveled about 2.5 million miles (4 million km) to reach the moon — about 10 times the actual distance between the Earth and the moon. The meandering path allowed NASA to spend more time testing the Grail probes' health, mission managers have said. After months of waiting for this weekend's main event, Grail mission scientists said it was worth working through the New Year's holiday to make sure the spacecraft arrive at the moon as intended. "Our team may not get to partake in a traditional New Year's celebration, but I expect seeing our two spacecraft safely in lunar orbit should give us all the excitement and feeling of euphoria anyone in this line of work would ever need," Lehman said.